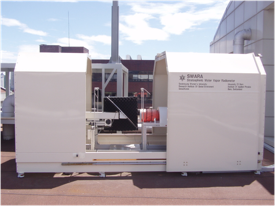 SWARA, the Seoul WAter vapour RAdiometer, is a microwave radiometer designed to measure the water vapour content in the middle atmosphere (20 to 80 km), covering the stratosphere and mesosphere. It is a joint project of the University of Bern, Switzerland, and the Sookmyung Women's University of Seoul, South Korea. The cooperation is based on the Swiss-Korean Outstanding Research Efforts Award (SKORE-A) that has been awarded to Prof. Jung Jin Oh and Prof. Niklaus Kaempfer by the Swiss Science Agency and the Ministry of Science and Technology of the Republic of Korea in 2003. SWARA began operating in Seoul (37°32'41'' N, 126°57'58'' E), on October 18, 2006. Its main goal is to provide longterm measurements of water vapour in the stratosphere and the mesosphere. In the middle atmosphere, water vapour has a strong chemical influence and, due to its long lifetime compared to other atmospheric constituents, serves as a tracer for dynamical processes. Consistent measurements are important for identifying trends and understanding the radiative and photochemical balance in the stratosphere and mesosphere. SWARA's data complements that of MIAWARA's, the MIddle Atmospheric WAter vapour RAdiometer, operational at the University of Bern (46°88' N, 7°47' E) since the end of 2002.